Harvesting two tangible fruits of The Harvard Campaign, the University formally inaugurated two new convening and meeting spaces—Smith Campus Center, in the Square, and Klarman Hall, at Harvard Business School (HBS)—on September 20 and October 1, respectively. The lower levels of the Smith Center (the remade Holyoke Center) now feature transparent walls: a invitation to enter and mingle, to see and be seen. Within there are seven eating establishments, including a two-story Pavement Coffeehouse, which has replaced Au Bon Pain, once a Massachusetts Avenue fixture; casual seating for quiet work and socializing; and performance venues. The interactive media walls inside the Safra Welcome Center lobby flank an information booth that has been thronged with visitors looking to find their way around campus. At the dedication, the renovation into the new center—made possible by Richard A. Smith, S.B. ’46, LL.D. 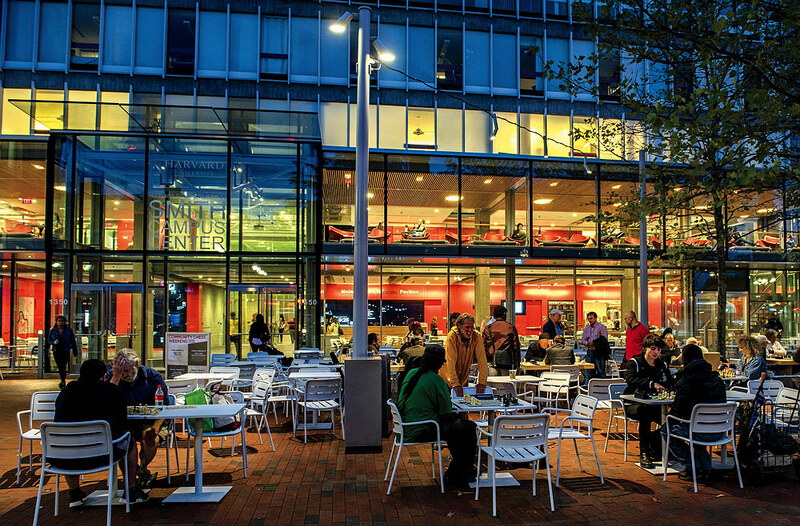 ’01, a former Overseer, fellow of the Corporation, and member of Harvard Management Company’s board of directors, and Susan F. Smith—was celebrated with performances in the welcome center, the “commons” space, and on the plaza by student musicians, dancers, and filmmakers, showing off the multiple uses the new spaces enable. The center is the keystone in president emerita Drew Faust’s “common spaces” initiative, meant to create places to facilitate interactions across the Harvard community. The September 20 program quotes her thus: “Spaces matter. They create unique opportunities in the present and make the past rush back to us in a vivid memory.” Smith Campus Center, she said, “will become an important hub of activity at the heart of our campus”—welcoming community members and visitors to the publicly accessible lower levels. The director of common spaces, Julie Crites, called it a counterpart to the Yard, or “the new front door to Harvard.” From invitations to sit on the prototypes in order to help select the center’s chairs, to surveys inquiring about the most desired amenities, views were solicited from students, faculty members, and staff throughout the planning. Tanya Iatridis, senior director of University planning, reported that perspectives were also gathered through 18 focus groups and nearly 6,000 responses to a campus-wide survey suggesting “a range of exciting concepts and aspirations for the building.” The planners used those insights to hit the community’s sweet spot: the place has been buzzing since its soft opening at the beginning of the term. Within, visitors have clear views of vitrine gardens (which intentionally blur the line between indoors and outdoors) full of plant species indigenous to New England. Mid-century-modern chairs and couches upholstered in contrasting shades of red, orange, yellow, and teal are arranged near gas fireplaces surrounded by birch-wood paneling. 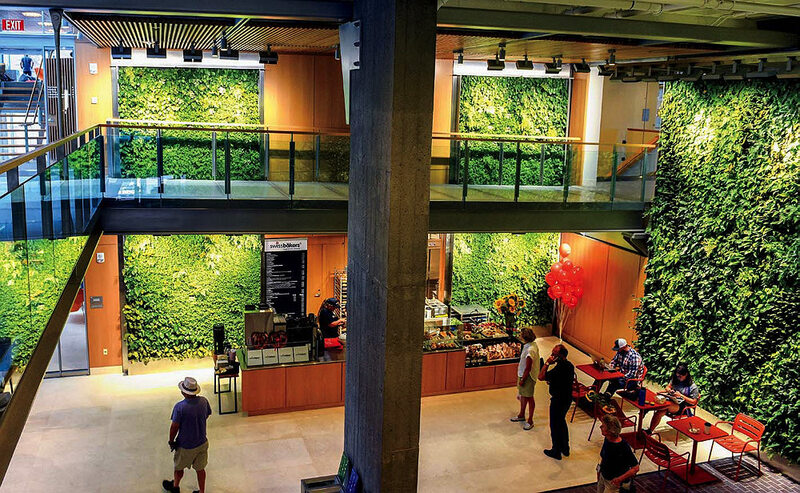 Just beyond the main lobby are walls covered with more than 12,000 plants representing 19 species, maintained through a rainwater filtration system from the roof. In addition to providing a central space for meeting, eating, and studying, the new center will also house the University’s Center for Wellness and Health Promotion. Thus, yoga and Pilates classes, massages, and acupuncture services (many hosted in the new multipurpose Mount Auburn Room, reservable by community members) come back to this central venue after a temporary relocation to 75 Mount Auburn Street. 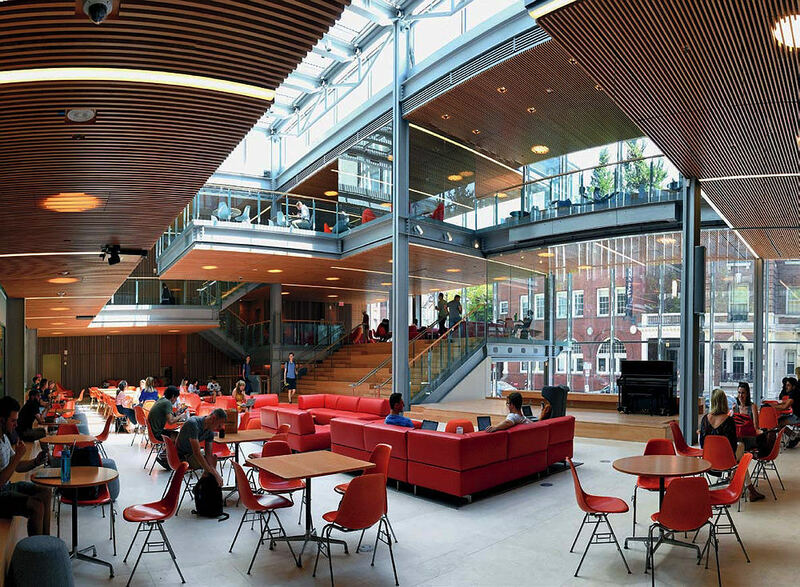 Klarman Hall, above, provides the Business School with meeting spaces capacious enough to hold an M.B.A. class—and future Allston neighbors. Just across the river, Klarman Hall includes an auditorium and meeting facility large enough to accommodate an entire 930-member HBS M.B.A. class. It also incorporates contemporary communications technologies and flexible meeting spaces that can be used for small gatherings, performances, and receptions. Named for a gift from investment manager Seth Klarman, M.B.A. ’82, and Beth Klarman, it is at the heart of HBS’s academic work—and, as the inaugural symposium suggests, central to its interest in engaging the wider University, too. Following the dedication, HBS’s Michael E. Porter, now Lawrence University Professor, and Cherington professor of business administration David A. Moss discussed the intersection of democracy and economic competitiveness. They were followed by a panel including Law School professors, a Faculty of Arts and Sciences lecturer on government, and journalists, who discussed democracy. The day-long symposium closed with a fireside chat between Seth Klarman and Jamie Dimon, M.B.A. ’82, chairman and CEO of JPMorgan Chase, on the viability of capitalism.